On the surface, 1943’s The Gang’s All Here released by 20th Century Fox, appears to be one of many World War Two era morale boosting escapist films. But this one is in the hands of Busby Berkeley–who was loaned to Fox by MGM, after being fired by Arthur Freed from Girl Crazy. Ol’ Louis B. liked the idea of sending Busby to another studio, rather than pay his contract salary for not working. Like many morale boosting musicals of the era, the plot is threadbare, a thin line designed to hang a bunch of numbers on–and the numbers in this one are something to see. Alice Faye, in her last starring role in a musical, plays a chorus girl that falls for an officer (James Ellison), who then gets posted to the Pacific and complications ensue. That’s the base plot, and frankly, it’s dull. Yet the screen is always filled with those amazing Berkeley production numbers — the real star of the film. 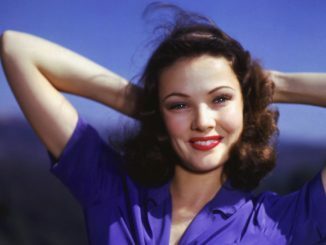 This was Berkeley’s first Technicolor film, and he did not waste it. The color is over the top, super saturated, and vibrant, like being punched in the gut with a box of Crayolas! 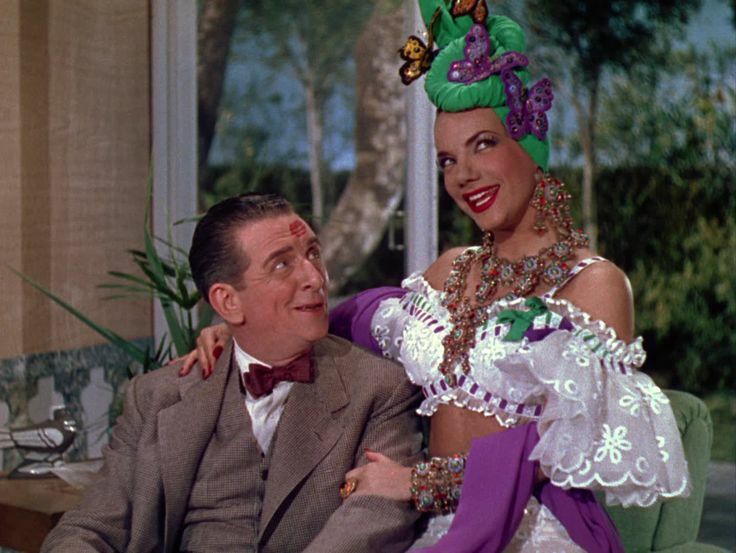 With both Benny Goodman and Carmen Miranda leading up the music end, there’s a whole lot to savor in The Gang’s All Here! 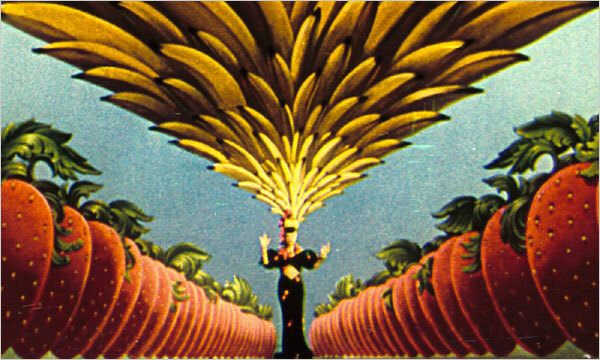 Miranda centers a noteworthy sequence with the number “The Lady in the Tutti Frutti Hat,” that features dancers holding comically large bananas. These large yellow bananas caused the Breen office to sit up and make several objections to their, um, phallic nature. Changes were made to the number to ease the fear of Fox sending colorful impurities out into the world. 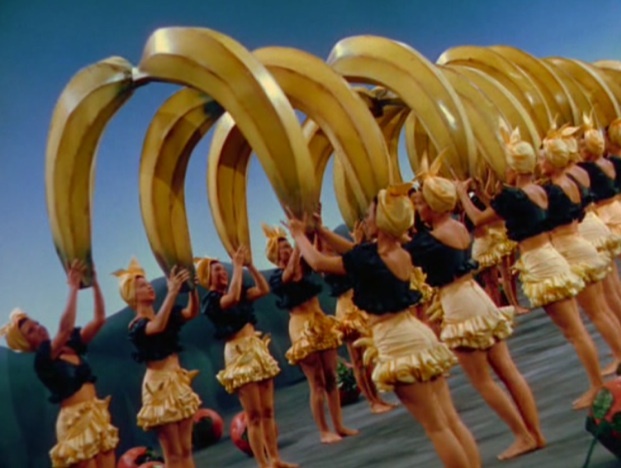 My favorite musical sequence in the film is one towards the end that employs dancers holding lit rings of pink neon–most impressive and striking. The Gang’s All Here comes to blu-ray thanks to Twilight Time, the 1080p picture looks good, though as vivid as the color is, the film is visually darker. 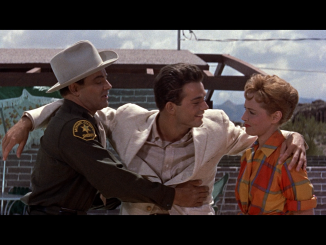 It’s by no mean unwatchable, but it’s not quite as good as other Technicolor films of the era I’ve seen in HD. I don’t know what shape the elements are in, which I suspect is the factor for this image. Audio is presented as a DTS-HD MA track, which sounds fine as well. Bonus features include an isolated score track, audio commentary by Historian Drew Casper. 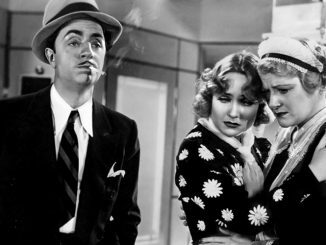 A second commentary track with historians Glenn Kenny, Ed Hulse, and Fran Smith Neeme, a short doc Busby Berkeley: A Journey with a Star, Alice Faye’s last film We Still Are!, a deleted sequence, and the theatrical trailer. If you’re a fan of Berkeley this is a must own, and anyone who enjoys a much rousing, escapist musical should pick this up without pausing to give thought. There’s a lot of enjoyment to be found in The Gang’s All Here. Where else will you find giant bananas and pink neon?